We are three hours into the new Fox TV series Alcatraz. So far, I'm a fan. I like the show. I'm enjoying the action. The acting's not bad. I actually like Jorge Garcia as Dr. Diego Soto, and I was concerned about seeing him as anyone other than Hurley. The third hour devoted to inmate Kit Carson had a pretty creepy moment in a prison exchange between Carson and the warden. This is a good show. Worth the time investment. But I do have concerns. Two, actually. The premise of the show has all of the inmates held at Alcatraz disappearing in 1963. Now they are coming back to present day the same age they were when they disappeared. And this is where my first concern comes in. I posted it on Twitter the other night. None of these guys are freaked out or baffled by the new technology they're seeing. No one is baffled by the way things look. Not the fashion. Not the cars. Not the TVs. Not people around them looking at their cell phones. My cousin says he noticed the same thing, but he feels confident that there is a logical explanation for it, and that it will be explained in the end. I'm not so sure. And that brings me to the second concern. I want to say again that I like the show. I'm a fan. But I'm afraid that with the pedigree this show has we won't get the explanation. Or at least one that's satisfactory. This is a JJ Abrams show. He's not a creator, but he is a producer. I've liked other Abrams shows. I really liked Alias. I was a fan of Lost. But there was a problem with each of the shows. The big mystery overtook the story. I'm afraid that's what could happen here. It's natural. It's understandable. It's the way of TV. You have these stories planned. You can have explanations. You can have endings. But if your show is a success then all of that likely goes out the window. You have to stretch the story out longer than you planned. On the creative end things get forgotten. Not everything gets explained. And that's my worry. Too much here will go unexplained if the show runs for a few years. Chasing Filthy Lucre is stuck. It's been out for almost a year now and the reviews it's received have been good. Really good, actually. But I could use more. When you are doing the publishing yourself you could always use more reviews. Can never have enough. Back to being stuck. Over at Amazon.com, Chasing Filthy Lucre has had nine reviews for a few months now. They are all 4 and 5 stars. But it's killing me to see it stuck at nine. I want that tenth review. Heck, I want 20 reviews. I want 30. Same goes for my newest story, Reunion. That story needs more than the one review it has right now. I don't know how to get more reviews other than offering a free book to anyone who agrees to read either book and then provide an honest review at Amazon and/or Barnes & Noble. Interested? Email me at jarrettrush@yahoo.com and I'll send you a copy of either book in whatever format you need. Or leave a comment here with a way to get in touch with you and which format you need. Just got an idea for a novel. Bigger and more complex than anything I've ever tried before, but it could be AWWWE-SUUUM. You were supposed to read that last part in a sing-song voice. No matter how you read it, though, the idea is awesome. I know that I probably shouldn't call my own ideas awesome. I should call it an idea with potential. I should call it something I'm excited about pursuing. But I'm not calling it any of those things. I'm calling it an awesome idea, because it is. Now, making sure the awesome idea becomes and awesome story is completely up to me. Like I said on Twitter, it'll be a bigger, more complex book than anything I've ever attempted. It'll have more settings, more characters, more action, but I think I can pull it off. This all got me thinking, though, about priorities and where to stack projects. I have the follow-up to Chasing Filthy Lucre that I've been working on and really need to finish. I have the rest of the Jackson Cane stories to write. I have another story that I've started and want to finish. And it could become another Jackson Cane-type series of shorts. I have a short story that I need to write to submit to an anthology. It's due in April. So where do I work in this new story? Do I move it to the top of my list? Do I just jot down the idea with enough detail that when I can get to it I won't forget it? I know that the professional thing to do is just stick the awesome idea at the end of the list. Finish everything as it comes up next and get to the new story when it's its turn. I don't know that I have a point to this post. I guess I'm just venting here. I know that it's a horrible problem to have. Too many good ideas. Oh, poor Jarrett. His wallet's so full of hundreds that it makes him sit lopsided. Who knows? Maybe these aren't good ideas. I like them, though. They have potential. They're fun. But which do I tackle first? Last week I put the finishing touches on the second Jackson Cane story. It's been sent off to my writers group for them to look at it. I've got a copy I'm hacking up right now. Then Gina gets her turn with it. Hopefully, though, I can get the editing done on this one pretty quick and make it available. It came in at 13,000 words, or pretty close to it. So it's 5,000 words longer than the original. At least for now it's longer. Who knows what it will be after editing. Longer for sure, but maybe not 5,000 words longer. And I know longer doesn't mean better, but it does mean more involved in this case. 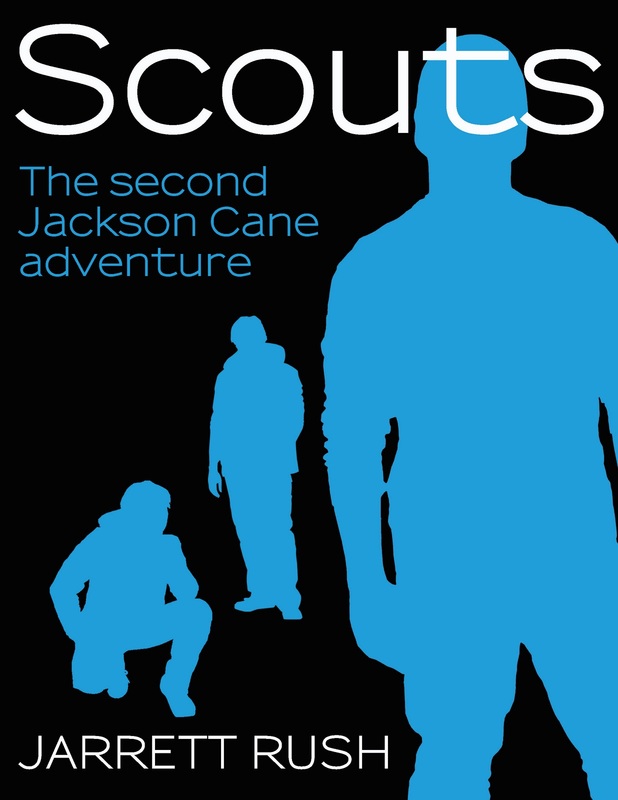 If you think of the Jackson cane series like a TV series, and I am, then this is Episode 2. It's the episode that follows the pilot and the one that gets the story going. In the first episode you establish characters and relationships. In episode 2 is where you start telling your story. That's what happens here. I'm happy with Reunion, the first episode in Jackson Cane's story, but this is where the story that will carry us through the whole first season of the Jackson Cane saga gets started. Right now there are four more stories planned in this first series of tales. At the end of it things will look much different than they did at the beginning. It'll be a bigger world that we are dealing with, and some of the restrictions established early on should be gone. Should open up the stories creatively, which will be good for me and for the reader. The story is called Scouts. Here's the cover. Look for it soon. "Let’s just say it now and say it proud, trumpeting it so loudly that You All The Way In The Back can hear: this should be the year that self-publishers take responsibility. For themselves and their work as well as the larger body of DIY work existing out there in the world. Let this be the year that indie writers step into Thunderdome armed to the teeth with all the best weapons and armor. (Instead of, say, a mop handle “sword” and a flak jacket made from Schlitz cans.) Let this be the year that you do the work and take the time to get your books up to speed so that self-published books become indistinguishable from any other book on the shelf. Because, let’s be honest: 8 times out of 10 you can spot a self-published book a mile away. Let this be the year that self-publishing serves readers as much as it serves writers." Chuck Wendig spends some words kicking the butts of us self publishers. He wants 2012 to be the year we start thinking about the readers. He makes lots of great points. There were several quotes I wanted to pull. There's a bit about self publishing being an insular world that I couldn't have agreed with more. I left the post excited and inspired. There's so much that self-publishers can do, but it's going to take us thinking differently. Thinking about innovating. Thinking about the responsibility we have. We can't just pat ourselves on our backs for going the "indie" route. What I copied above is just the nut graph. Go read the rest for yourself. Be warned, though. Chuck writes this in the way that only he can so watch out for the dirty, dirty words. 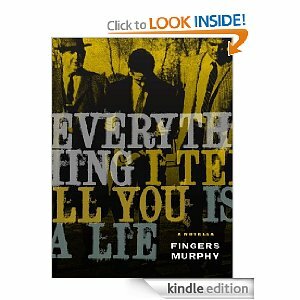 I mentioned at Christmas that you all needed to get Fingers Murphy's Follow the Money for your new e-reader. I meant it. You need to get it. Trust me. But if you don't, you do need to get his novella Everything I Tell You Is A Lie. Why do you need to get it? Because he's a great writer. And because it's free for the next couple of days. You get a chance to try him out. I have no doubt you'll like him. 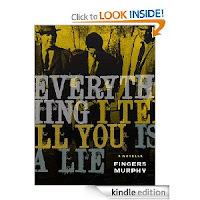 Go here and download it to your Kindle. And sorry Nook users, looks like this one is only for the Kindle. I know I was supposed to write this post some time last week and post it yesterday. But I've been enjoying spending time with Gina while she's been on Christmas break from school. Besides, it doesn't seem like a new year until Monday when everyone goes back to work. I haven't had a lot of motivation to write much here, especially nothing that looked back at 2011. It was a weird year for me. There were a lot of downs. I lost my aunt in January and my grandmother in October. I lost my job in September. But there was one really huge up in 2011. In October, Gina found out she was pregnant. That sort of helped gloss over all of the bad stuff. It sets up 2012 to be my best year so far. On the writing side of things, 2011 wasn't too bad. I published two stories, and hit almost 200 sales. I started to build a readership. I've got a few plans for 2012. I'm not calling them resolutions. The only resolutions I've made are with Gina and probably of little interest to those of you who are here. The plans I've made are goals. 1. Publish the second book in the New Eden series. 2. Write and publish the rest of the Jackson Cane series. It's five stories right now, and I've got the second almost finished. The remaining three are loosely plotted. They should be easy to write. 3. To keep building my readership. Or following. Or presence. Or platform. Or whatever they call it. That's going to include blogging more regularly. Tweeting more and with the right people. When I started using Twitter I was getting so much more out of it. I'm not getting that now and I really think it's because I'm not using it like I should. I'm planning on making some changes there, but that's another blog post for another time. Pretty simple goals, honestly. And all stuff I can control. Notice, there are no sales goals on there. That's because I can't control those. I can make sure people know about my books, and I try to do that, but I can't make them buy. But, hopefully, if I can be successful at goal No. 3 then sales will follow. So, auf wiedersehen to 2011 and guten tag to 2012. It's going to be a good year. I'm going to be a dad.